Auguste Toulmouche (21 September 1829 - 16 October 1890), French painter. He was a student of Marc Charles Gabriel Gleyre [1806-1874]. He specialized in “costume painting”, as did his students, including Jules Émile Saintin [1829-1894], Joaquin Pallares y Allustante, and Charles Joseph Frederick Soulacroix [1825–]. They depicted beautiful women in interiors, in a sentimental and romantic way. The subject matter of a picture was the primary consideration, and its success depended on the expressiveness of the characters, a quality directly derived from history painting. The parents of Emile Auguste Toulmouche were Toulmouche Rose and Sophie Mercier, and he had an uncle sculptor. Starting from 1841, Auguste Toulmouche received the first elements of the design in the workshop of the sculptor Amedeo Rene Menard. Then Toulmouche expanded his studies by taking a few lessons from painting with Biron, a painter of portraits and religious scenes registered as a teacher of drawing and painting at Nantes from 1844. 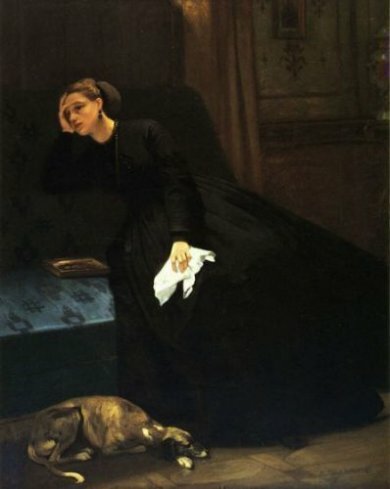 In 1846, Auguste Toulmouche went to Paris to follow the teaching of Gleyre. Gleyre was a peculiar professor at the Ecole des Beaux-Arts, and a member of the Academy. Girl (1852) was bought by Napoleon III, the first step (1853) by the Empress Eugenie, and after lunch by Princess Mathilde. Toulmouche had success with its small tables of a genre called neo-Greek. 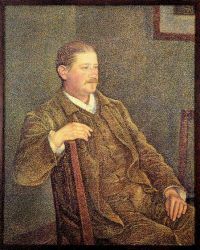 The reading lesson (1855), was the subject of much criticism by Théophile Gautier. After the War of 1870, his fame fades gradually, like painters of his generation.